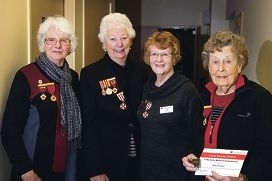 Joan Lampard, Audrey Poole, June Pillion, Ruby Stewart are the Red Cross Award recipients. WA division executive director Steve Joske presented long service awards to Audrey Poole (60 years) and Ruby Stewart (20 years). June Pillion and Joan Lampard received distinguished service awards for their dedicated service to the busy unit. Members later socialised over a shared lunch. The unit meets on the second Thursday of the month at Mildenhall in Beddi Road, Duncraig at 10am. The unit’s Care Centre meets every Tuesday at Greenwood Scout Hall in Calectasia Street, 10.30am to 2pm, for craft and socialising. To join, call Colleen on 9342 2806.